It took about 5 minutes to install this into my iMac (2008 model). This computer is my main workstation, runs 24 hours per day. Works great! Fantastic price! Komputerbay claims they test all memory modules before they are shipped. I don't think they tested what they sent me. I installed the 4gb module in my Macbook Pro, and it would freeze on me after booting up, within just a few seconds of trying to do anything. Ordered this Wed. got it Sat. - awesome. Works fine in my 2.4Ghz 2008 Macbook Pro. This computer was originally said to max at 4GB, but it was found that it could take up to 6Gb. I upgraded from the original 2Gb to 4Gb in the past, but then Lion and Chrome kept grabbing even all that, so with this I'm going for 6Gb (4+2), and it's working so far. Great price too. 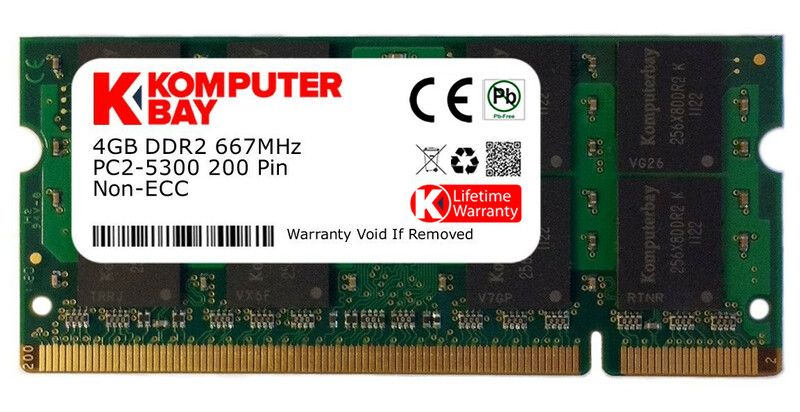 I ordered this memory module to upgrade my Acer Aspire One netbook, model: AOD150-1322 (a Costco exclusive outfitted with an Intel Atom N280 1.66 GHz CPU). I had been unaware that Intel's Atom N280 CPU cannot address a memory module greater than 2GB when I ordered it. Sure enough, my netbook failed to boot after installation and I confirmed my errant choice on Intel's website. I cannot protest providing return shipping for such an errantly made purchase as such a policy is routine for most online vendors. But I have dealt with many computer hardware vendors whom consistently do not charge a restocking fee for 100% resalable unblemished packaged & usable goods. I shall never order anything from Komputerbay in the future. Such an upstart company's reputation is dubious at best and they should consider their return policies accordingly. After-all, amazon is not eBay! Excelente product. my computer is working super fast now. and the item got really fast to me. Great product at a great price! Review by J.J. I am very happy with this 4GB RAM upgrade from Komputerbay. I used it to upgrade my MacBook RAM (from 1GB) and its performance has significantly improved since. Works great on my 15" Macbook Pro, when paired with the original 2GB memory in the other slot. I used them to upgrade my MacBook Pro to 8GB total. Worked as expected. Packing is good. Shipment arrived when expected. 667mhz 4GB RAM Module -- Komputerbay Rocks Review by tazpizzazz "Taz"
4GB RAM Module from Komputerbay worked perfectly out of the well-packed box. Brought fresh air to my older 2.4ghz Aluminum (pre-unibody) MacBookPro. The price was fair, shipping fast. Sometimes it is difficult to find good prices on older SODIMMS, so the search for my MacBook upgrade was a little frustrating. The challenge in my old White MacBook is that it only supports a total of 6GB RAM, so you have to put a 4GB stick in with a 2GB. This Komputerbay 4GB stick came quickly (thanks Amazon Prime) and installation was a breeze since I had previously upgraded my MB to 4GB from the original 2GB. I was a little concerned that having different brands in could be a problem (even though it shouldn't be) and a little more concerned that Apple technically lists the maximum RAM as 4GB. Long story short: I've had the RAM for a while now and I'm very satisfied. This upgrade plus my 120 GB SSD have given new life to this old machine. In fact, as I sit here on the sofa *working* on code for a client, I'm thankful that this machine that I pretty much had given up on 6 months ago is now a tool with which I can generate revenue! It works! 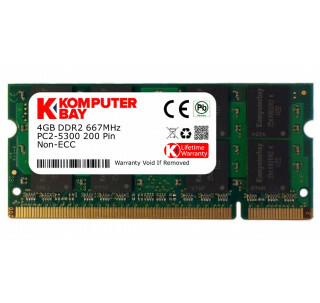 Review by J. P.
DDR2 memory is getting harder to come by at a decent price so I was very happy to find this 4GB module at the price it was offered. I was a little hesitant since I have never heard of KomputerBay but with their own warranty and Amazon's excellent reputation for keeping customers satisfied I decided to give it a try. Product: No visible imperfections or damage. Test: Laptop booted and immediately recognized the extra 4GB of memory. Passed all memory tests. Verdict: I must say I am quite happy with the product. 4GB module continues to operate flawlessly. Early 2008 MacBook Pro Review by Johnny J. Lopez "johnnyrokkit"
I had some reservations from some other reviews about the quality control of this memory. Thankfully I have not had any of those issues. I bought this to install alongside a 2GB stick in a 2008 white macbook. The memory works as expected, bringing me to the max of 6GB for this model. i don't know how good it is. but i know it works. be careful when you buy RAM, your computer may limit the actual storage that really takes effect. some computer even don't support and recognize RAM of such large storage. realize how large a ram your computer can support before purchase. Just upgrade my old laptop and everything goes smoothly with my extra 4gb of RAM. Reviewing because i am satisfied with my order. Excellent product, the computer works faster and better really comes alive. Arrived quickly and worked without any problems Review by Philip G. Michaels "Phil M."
Great Product... Works as expected. Review by T.K. "Mr. B"
It works fine Review by jayk "jayk"
Works Fine Review by Ben S.
This 4GB DDR2 SODIMM RAM will work for a wide variety of system. With that said I purchased it to upgrade my 2007 iMac. Mac officially states that this model can only handle 4 GB total, but it can handle 6GB. This is why I searched so hard for an affordable single 4GB stick. The best price that I could find was with komputerbay. Komputerbay listed the product honestly; they shipped it quickly; and I have no complaints about their customer service. I have iStat installed on my 2007 iMac and I was starting to notice my RAM reaching maximum capacity on a regular basis upon upgrading to Mavericks. My iMac is supposed to have a 4GB limit, but I read online that it would in fact accept 6GB. I ordered this RAM from Komputerbay and I'm here to say it works! I have 50% more RAM capacity at 2/3 the cost I found anywhere else. Well, I bought this Komputbay 4GB Stick for my HP Pav6869, Vista Special Edition Laptop which was originally 3GB RAM. Kept the 2GB Stick, put in the Komputerbay 4GB Stick. man O' Man!! for $68.00 Wow!!! Greased Lightening!! Replace so quick Review by Shigekazu Omori "Gadget man"
Product was exactly as advertised. Shipping was very fast. Packaging was appropruiate for the product I purchased. It worked perfectly in my system. The documentation was excellent, the compatibility list was accurate. My system is much faster now and very stable. Very happy customer, will shop here again!! The RAM arrived as described, well-packaged and in a timely fashion. I installed it in my MacBook Pro 4,1 (which is rated for only 2x2GB from the factory, but users have discovered replacing a 2GB with a 4GB module can go to 6GB) ever since, and had no problems. The 6GB RAM runs Mavericks fine. Took a chance... Glad I did! Review by John Gobert "JGobert"
Being an IT professional for over twenty years I have definitely bought my share of good components and bad components. I've dealt with some great companies and some really, really bad companies. I've seen the price of RAM change every time the wind blows in a new direction and I've done my fair share of RMA replacements for bad RAM modules from top shelf manufacturers. Like most other people I'd never heard of Komputer Bay memory before I started seeing their listings on Amazon. What drew me to give them a chance was the price and availability of the module I needed for an older machine. I figured that if the part didn't work out I could leverage Amazon's policies to protect myself and recoup the investment. Now that I've received, installed and used the RAM module for a few weeks I'd like to share my thoughts. The module, so far, is rock solid. Testing shows that the DRAM specifications are exactly as they should be for what was advertised. Performance is great, power draw is in line, and I'm yet to find any hint of errors or stability issues. Simply put I can't tell the difference between the module I bought from Komputer Bay and one that would have come from Kingston, Crucial, or any of the other top shelf brands. I can assure you that my next purchase for memory will include Komputer Bay in the shopping process. If you're in the market for RAM I seriously suggest you give these guys a chance. You have nothing to lose and everything to gain by saving money on Grade A memory products.